One thing that I have noticed, in a small town, is that you can’t really look without being seen. In a big city, you can wander around anonymously for hours checking out the place. But here in Keller, the only way to see the streets closely is to walk them, and to walk is to be seen by many sets of eyes. Since arriving in the Wheatbelt, I’ve been collecting board games from op shops. Many of these games have a sort of “territory” basis – the flat board represents land, and the players are miniature entities that traverse this land in pursuit of some goal. It occurred to me that Keller’s layout was compact enough to be emulated in this manner as well. I like the tension created by the idea of having a “wrong” and a “right” side of the tracks (even if that is just a made up distinction). To play the game, you could choose to be one of the many characters I have met and written about so far: Reynald, the Nyungar tourguide; Pauline, the shire president; Greg, the artist “hermit”; Roger, the environmental scientist etc etc. Each of these characters would have a different goal – often these goals would conflict with each other. Could the game utilise a trope from “Sim City” – such as the idea of “repopulation” as a generalised “good outcome”? Or would one of the characters have something at stake in the idea of radically changing the social fabric? Later in the day, David Blair came and helped bust into the cinema, whose keys were lost by Camila the Brazilian artist in January. David is going to change the locks soon, but in the meantime, he is pretty handy with a pocket knife. I had been into the cinema before, but I was even more blown away this time. It is a gorgeous building full of light and air. David turned off the tap to the toilet upstairs while I nosed around and tried to imagine it full of people for our Expanded Cinema event. There is even a backyard – though i suspect by the end of May it might be too cold to use it. Next door to the cinema is Old With Style, an antique store run by Colin. 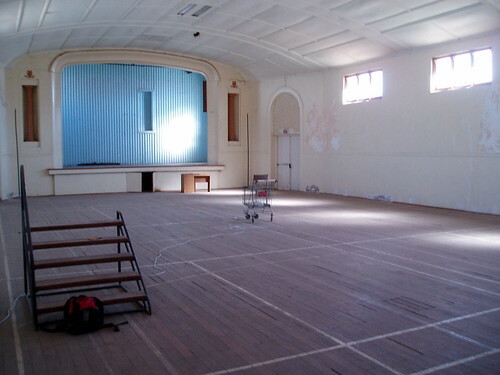 I had a chat with Colin about how long he’s been in the town etc…he said he can remember the front rooms of the cinema building being used, most recently, as an antique shop, and before that, the big hall was a youth centre – which would account for the volleyball or badminton markings on the floorboards. Its former life as a cinema was “before his time” – I think he said he’s been in Keller 25 years (?). I bought a typewriter from Colin, as I figured I would probably need it at some point, and it was only five bucks. Jo Debney, the Yorkshire lass who looks after the gallery, had brought in a book about her native county to show me. There was a quasi aerial photo of Yorkshire covered with snow. In the middle distance, a speck on the photo represented Pleasant Pastures, the building she had grown up in. Contrary to its name, that home was bleak – no electricity, no running water, and an icey wind whistling through nearly all year around. There was something special about that page in the book, and she had neatly marked and labelled with a biro her familiar haunts. The page, around where Pleasant Pastures was located in the photo, was worn and slightly erased, no doubt from the many times she had jabbed at it with her excited finger. Jo also showed me a book about the Yosemite National Park in the USA. She loves mountains, and indeed “Half Dome,” the principle mountain of the park, was impressive and awe inspiring. We had a short exchange about the nature of photography – the way that a photograph of (say) a sunset is somehow always less that the experience of the sunset itself…and I think there is something of that in the way she feels about Half Dome Mountain. The photograph works as an index to her memory which triggers something of the way she felt when standing there in front of it. The photo itself, if you have never been there, is just a well made photo. My good friend Chris drove up from Perth and stayed the night. We drank wine with Cristina and ate some tofu pumpkin curry I made, and later we played a board game called “Careers”. The subtitle for “Careers” is “The Parker Brothers Game of Optional Goals” – a lacklustre moniker if ever I heard one. That sentence made me think of “Mutual Obligation” and other Centrelink beaurocracy-speak. And yet, there wasn’t much scope in “careers” for unemployment or “alternative” lifestyles – the career paths you can embark upon begin with college, and include Big Business, Farming, “going to sea”, “running for office”, and even a moon expedition! There are 3 factors to success in careers: money, fame, and happiness, and players earn units of each of these factors as they gain experience. It is only when you achieve a pre-determined equilibrium of money, fame, and happiness, that your career can be considered to have succeeded, and you win the game. It’s a real 1950s American philosophy – the assumption is that all players are men. I was proceeding through a Big Business career when I landed on a square which said “You have a gorgeous secretary – take 2 happiness points”. We rolled around laughing at that one.